Ice chippers are identified as those ice tools with multi-picks. They were used to break large ice blocks into smaller chips for drinks, in ice cream makers, to pack around food or other items to keep them cool. L = 8-3/4" PAT MAY 31 92 in raised lettering on the surface between the picks. Wing nuts on top of the pick support, provides access to replace the picks. L = 6" No markings. No ferrule. L = 5-3/4" Cap lifter on the pick support. No markings. L = 11-1/2", The patent number 2070773 is on top aft end of the cube catcher. THE COOLERATOR COMPANY, DULUTH, MINNESOTA, UNITED STATES OF AMERICA is on the handle. Used to Chip Off Cubes From Top of Ice Block After Cubes Are Formed by Ice Cubers. Handles available in natural, red, green or yellow finishes. PAT NO. 2070773, on outside rear of the ice cube catcher. Metal portion is very dark like it may have been in a fire and the handle may have been changed??? Handle is barrel shaped. The handle on salesman's example of this type chipper states the handles are available in red, green and yellow. This is the only I have seen with one of these colors. Whether it's the original handle or not I can not tell, but I am a little suspicious. L - 9-1/8", No markings. All metal chipper with a six sided handle and tine support. No markings. DELUXE on one side of the pick support and Deluxe (script) on the other side. Also notice the shape around the lettering is different. About 25% of brown paint on the handle is missing. L = 8-1/4" extended, 8-1/4" compressed; the handle compresses 1-1/2". All metal. PAT. PEND. is stamped on the shaft holding the points and there is a spring in the handle. 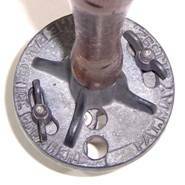 The tool is held together by a heavy gauge wire from the shaft support through a hole in the end of the handle and then looped. ICY-O cast in the support between the handle and the picks. This metal is non-magnetic. Ferrule is missing. ICY-O was the company that made drink bottle dispensers and vending machines for Coca Cola Bottling as far back as the 1920s. A gift from a friend, Garnet Candelaria. ICY O cast in the upper portion of the ting support. Garnet's story of the pick is provided below. Also included below is a little info, found on the internet, regarding the chipper manufacturer. 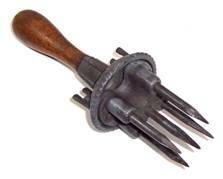 My first memory of the ice pick was in the late thirties when I was about three and a half years old. 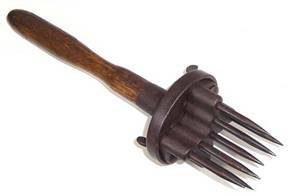 At that time the ice pick was not new and had been in use for many years. I would guess it dated back to the early twenties or possibly older. Due to my age, I was not allowed to even touch the ice pick, which was most likely a very wise decision on the part of my parents. However, I had three older siblings who got to use it. At the time we had an ice box and we had ice tea every evening for dinner, mostly because the water in Chickasha, OK was not fit for human consumption. It was really bad stuff. So, I just stood by and watched to older ones chip the ice day after day. I thought it would be great when I got old enough to enjoy this chore. However, my siblings never thought of it as a great thing to do - it was one of those chores that had to be done. Then when I was almost old enough the rest of my family was all excited about getting a new refrigerator!! So, I never got to chip ice for the tea. And, it was no fun at all to watch them struggle to get the ice cubes out of those ugly metal trays and wondered if they ever missed the "ice box". Obviously, no one did. I'm not at all sure or why I ended up keeping the ice pick. However, it has come in handy in recent years to deal with the "ice storms". It has chipper lots of ice over the years. 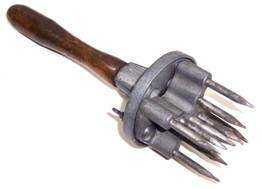 For many, many years I thought all ice picks were heavy and four pronged like this one. However, it was somewhat of a shock to me when I saw my first "new" ice pick that had only one long skinny prong. These new ones were never as well made as strong as this old model. It's my pleasure to give this to you, Bob, for your collection. I hope it will last another hundred years or more. The Icy-O Company, Inc. was located on Peachtree St. and Clement Ave. in Charlotte, NC. The company was in operation in the 1920's, however, I don't know the company's history. The company was a manufacture and distributor of beverage dispensers. I'm sure they must have made other items, such as, the chipper as shown above. L = 9", A single tine ice pick with a four tine chipper attachment. A guard is provided for the chipper tines. PAT. APL'D FOR on the tine guard. HUBBARD ICE & COAL CO., CEDAR RAPIDS, IOWA plus other markings on the sides of the handle. L = 8-3/4", without the tine guard. L = 8-1/8", Ice pick only. Views of typical profile and end of handle. L = 8-3/4" No ferrule. ALASKA on back of pick support. Metal protrusion on end of handle could be used to crack ice. L = 8-3/4" ALASKA on back of pick support. Metal protrusion on end of handle could be used to crack ice. L = 9-3/8" LIGHTNING, NORTH BROS MFG CO, PHILA PA USA on back of pick support. Metal protrusion on end of handle could be used to crack ice. L = 9", THE A F Co. impressed on back of pick support. Metal protrusion on end of handle could be used to crack ice. L = 8-3/4" No ferrule. WHITE MOUNTAIN on back of pick support. Metal protrusion on end of handle could be used to crack ice. 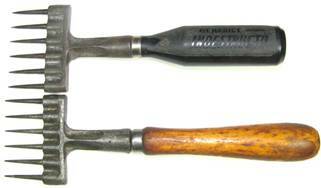 L - 8-7/8", All metal tool, "SENSIBLE" and "PAT PEND'G" on opposite sides of the tine support, taper four sided pick on one end of the tine support and hammer head on the other end. Tines are tapered on the ends. This chipper was modified from the six pick configuration to four picks by cutting off the two outside picks. When looking closely at the ends of the pick support, one can see saw marks. No special markings. See the figure to the right for comparison. L = 7-5/8", There are no markings on the chipper. This chipper has been modified from a six pick chipper. The two outside picks have been removed and the ends smoother. Look in the section of six pick chippers and you will find some similar chippers with six picks with and without markings. L = 8-1/8", C.S. OSBORNE, stamped in the middle on the pick support. C.S. OSBORNE is a well known maker of leather tools. Even though this was a leather tool, it was probably used as an ice chipper. L = 8", PAT. MAY 31, 1892 THE PARKER ICE CRUSHER on a beveled edge around the pick support. The wing nuts allow the pick support to be loosened in order to remove the two outside picks on one axis to form a straight line chipper with three picks. By disassembling the pick support enables the chipper to be configured with one to five picks. SPUN FERRULED, 2NICHOLSON FILE CO. USA, and PATENTED stamped on the handle and parallel to the long axis of the handle. Copper or brass ferrule. Each of the five picks is pinned in the handle -to-pick adapter. 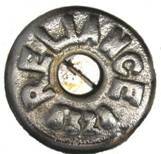 The patent relates to the manufacture and attachment of the ferrule and the handle. The Nicholson name is big in the manufacturing of handles, files and ferrules but not known for making ice chippers. SUPER on the pick support, RELIANCE 32 on top of the cap. L = 9", UNITED ICE SUPPLY on one side of the pick support an NO. 100 on the other side. L = 7-3/4", KIPIL in raised letters on the smooth area on the pick support. L = 8-5/8", No markings. L = 8-1/4", No markings. L = 9-1/8", ALASKA FREEZER CO, WINCHENDON, MASS. plus other markings on the four sides of the handle. L = 8-1/2", No markings. L = 10", All metal CITY ICE CO. PHONE 2-7222 on the flat areas of the handle. Cap lifter with one tab on the end of the handle. L = 9-1/8", No markings. L = 7-3/4", VAUGHAN CHICAGO in a small circle in the upper left corner of both sides of the pick support. Shows top of pick support of this patent. L = 9", GILCHRIST NO. 50 on the metal area between the handle and the pick support. L = 9-1/8" GILCHRIST 50 on the metal area between the handle and the pick support. L - 11" , Picks - 3" long! Comparison to a typical Gilchrist No. 50 chipper. GILCHRIST NO 50 in raise lettering. The picks are 3" long, much longer than usual. The patent is related to the manufacture method of inserting the points (picks) into the support web and mentions it relates to "Chippers" which are used for breaking or disintegration ice or other materials. I wonder if this tool, with the longer picks, were made for some other use than an ice chipper! L = 9", REV-O-NOC on the metal area between the handle and the pick support. L = 8-7/8", VIV-KOLD CHIPPER on the metal area between the handle and the pick support. L = 8-7/8" HAMILTON BEACH NO 50 on the metal area between the handle and the pick support. L = 8-7/8" BRIDDELL NO. 60 on the metal area between the handle and the pick support. RELIANCE case in the pick support near the ferrule. No other markings. L = 7-7/8", No markings. Notice the different interface between the pick support and the handle extension. L = 8-1/2", All aluminum except for the picks which are steel. Same markings on both sides. "Castcraft" with "ATLANTA GEORGIA" in the ribbon under the first marking. "Castcraft" with "ATLANTA GEORGIA" in the ribbon underneath cast on both sides. This marking is about one-half the size of the marking on the other marked chipper. All aluminum except for the picks which are steel. L = 8-1/4", All metal. No markings. L = 7-3/8", Five groves around the handle. No other markings. L = 6-1/2", No markings. L = 8-1/4", BRIDDELL U.S.A. NO. 66, on the top of the pick support. L = 7-7/8", BRIDDELL U.S.A. NO. 66 on the pick support. Five groves around the handle. L = 7-3/4", BENEDICT INDESTRUCTO on opposite sides of the handle. Handle material is unknown. May be plastic! L = 6-3/8", Picks are thinner than most chippers - 0.1" diameter. The handle screws into the pick support. The handle may be used in other tools? L = 9", "Craft" STAINLESS STEEL, CHICAGO, on the pick support. L - 9-1/4", CRAFT MFG CO. STAINLESS STEEL, CHICAGO, on the pick support. L = 8-7/8', The pick support is two shaped sheet metal halves riveted together to hold the picks and the protrusion from the handle. 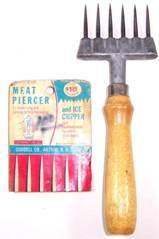 L = 7-3/4', The sales card defines the tool as MEAT PIERCER and ICE CHIPPER, GOODELL CO. ANTRIM, N.H. 03440. There are no markings on the ice chipper. It's believed the handle was replaced since it was loose and the only other pick support configuration like this is found on the BENEDICT chipper as shown to the right. Comparison of pick support and handle configuration for the subject chipper to the BENEDICT chipper. L = 7-7/8", WILLIAMSON in raised letters on metal portion of the handle..
L = 7-7/8", WILLIAMSON NEWARK N.J. in raised letters on metal portion of the handle. WILLIAMSON NEWARK N.J. in raised letters on metal portion of the handle. The thing most unusual regarding this chipper is the handle. This is the only square handle I recall seeing a Williamson chipper. The markings on the four sides of the handle are; 1) E.HARRIS & CO., 2) PHONE 50S, 3) ICE - COAL - WOOD, 4) ICE CHIPPERS 50 (cents mark) EACH. L = 9", JAPAN on side of handle near the top. New chipper. L = 7-3/8", No markings, The picks have been ground down to small chisels. Protruding metal button on end of handle for cracking ice. L - 8-5/8", The support for the picks is cast aluminum. No markings. L - 33-3/4", Long handle with 7 picks, 6 in a circle with 1 in the center, all parallel with the long axis of the handle. Screw on the side of the pick support for replacement of a broken handle. The picks are molded into the support housing. L = 8-7/8", No markings. Bought this tool thinking it might be an ice chipper as defined by patent 1,485,257. However, after examining the tool I found it doesn't fit to the requirements of that patent. In fact, I'm not sure it's an ice tool and I don't know what or how it was used. Any suggestions. L - 13", No markings on the metal part indicating this is probably a pre-patent item. This item is slightly larger, about 1-1/2" longer, than the patented item. The wing nuts allow the top cover/handle portion to be removed to adjust the number of picks and their arrangement. Removing the outer pick from two opposites will leave five picks in a row and the chipper can be used as a shave.